Miami Norland Senior High track star Tyrese Cooper has been arrested again, charged with stealing a car. A grand theft suspect successfully ran away from police in a chase after crashing a stolen vehicle in April. 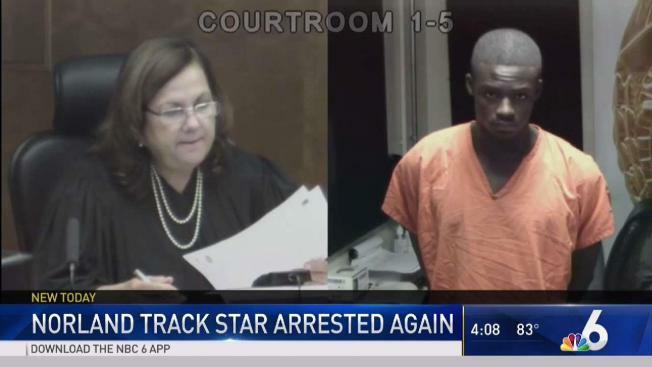 Weeks later, the Miami Gardens Police Department identified the suspect as 18-year-old national track and field star Tyrese Cooper. Cooper's first arrest was on May 1, when he was charged with attempted grand theft of a vehicle in a separate case, but that wasn't his first run-in with the law, according to an arrest report. On April 20, MGPD patrol units were searching for two stolen vehicles racing in the area, including a gray Dodge Charger. When police units arrived, the two vehicles fled in different directions in the area of Sunshine State Parkway and NW 196th Street. One officer chased the gray Dodge Charger, which crashed into a fence near the Florida Turnpike. After crashing, the suspect exited the vehicle and ran off. Police set up a perimeter, using K-9 units and a helicopter search, but the suspect was not found. However, an iPhone was found on the driver's seat. The iPhone's screen also displayed a picture of a man, according to the report. The officer who chased the suspect in the Dodge Charger said the man on the screen was the same person who was in the stolen vehicle. Upon seeing the picture, another police officer identified the man in the image as "Smoke" – Cooper's alias. On Monday, fingerprint analysis of the stolen Dodge Charger came back – matching Cooper, according to the report. Cooper was arrested on Thursday at Miami Norland Senior High School. Cooper has been charged with third-degree grand theft of a vehicle and leaving the scene of an accident involving property damage. Cooper, who after his early May arrest said he planned to graduate high school early to attend college in December, is a top athlete in the 100 meters, 200 meters and 400 meters events.